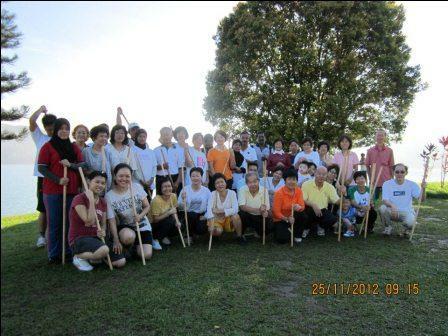 Update in August 2017– View the updated location of cane exercise classes in Penang. Update 1 May 2014- Cane exercise venue has changed from Mengkuang Dam to Robina Park. Robina Park is after the RMAF at Teluk Air Tawar ( Butterworth ). 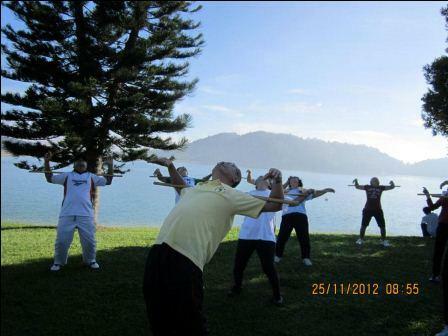 Is by sea side & the exercises are conducted under the trees. Even though I only attended few classes of Cane Exercise from Taiwan- but with the canes I’ve bought, I practice the exercises at home. It is effective help to relieve body discomfort and stiffness. I’ve written about the cane exercise after attending a session of the class where the founder paid a visit. However, my work commitments made it not possible for me to continue attending the classes held in Klang Valley. 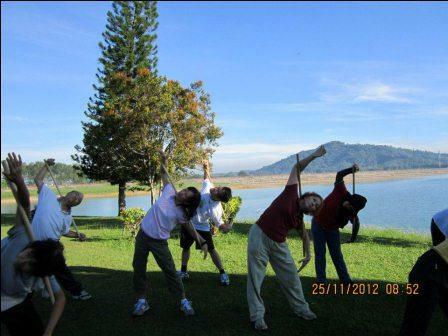 Nevertheless, I wanted to promote the cane exercise as much as I can because I can personally feel the benefits. Last week, I received an email from Jessie. Jessie had been practicing cane exercise on her own since 2005 after receiving a DVD of the exercise from her sister-in-law. She practiced the exercises by herself without any guidance almost everyday without fail. 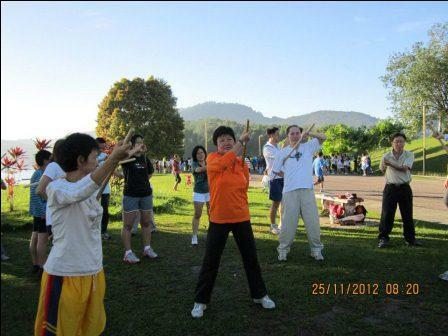 Then in 2010, she started going to the Mengkuang Dam in Bukit Mertajam to work out on her own. 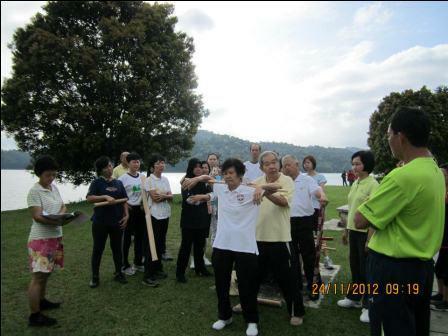 Just few days back, Jessie has invited Master Yong and Master Teoh to come to Mengkuang Dam to do a class demonstration for 2 days. 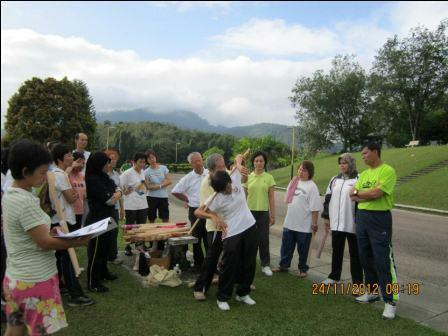 The two days of Cane Health Awareness class was attended by Malaysians from all walks of life and races. The participants were able to experience how the real cane exercise is like and got free advise on how to use the cane to treat health ailments. Jessie, thanks very much for sharing your photos- so that I can write more about the benefits of cane exercise to create more awareness about this effective exercise. On the 2 photos above, where the cane is placed on both shoulders and then the body is bend sideways left and right- for the first time and those with tight shoulder muscles- it can be quite painful. But done often, it can help correct hunched back because you would notice that both shoulders are pulled backwards. At first when you do you may not be able to hold the position for long but gradually the time would improve. Shoulders would get less tensed up. Posture would improve. Shoulder stiffness also can lead to frequent headaches and issues such as carpal tunnel syndrome (CTS usually starts from the blocked shoulder meridians). This simple and yet free exercise can help improve the condition. Above: Cane is used to rub on the sides of the knees- from top to down the ankles. Good for those with knee pain. You can see as the entire massage and rubbing is done by the participant himself/ herself and it requires considerable amount of stretching as you move from up (upper thighs) to down (ankles). That is why Jessie mentioned she had gotten so much more flexible through practicing these exercises. The photo above- the lower back and buttocks are rubbed using the cane- for those who have lower back pain…the exercise can help relieve it enormously. The photo above- the left hand hold the back of the cane while the right hand rotate the cane around the armpits. When I did this exercise- it is quite painful- but this exercise is very good to help to improve the circulation of the lymphatic nodes- that are very concentrated on the armpit and the upper thighs area. I believe it can help to prevent breast cancer because the movement of the exercise prevent any waste or toxins from getting stagnant (the breasts are the nearest to there). 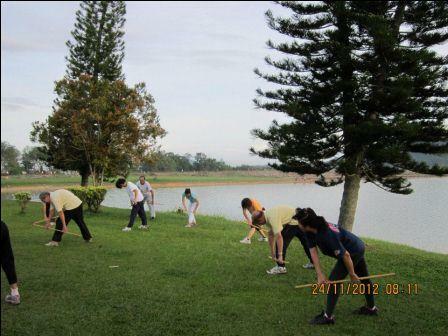 As with all the exercises, initially is quite painful but after a while, it gradually goes lesser and lesser. Jessie mentioned that she no longer feels any discomfort or pain doing this exercise anymore. Even though I’ve not met Jessie personally, but I really admire her preserverance- she practiced on her own by referring to the DVD- which was in Mandarin (that she can’t really understand). Regardless of whether there are those who come and practice or not, she still practiced consistently. That’s the true spirit! 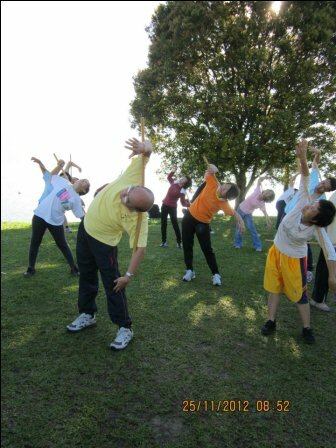 The founder in Taiwan intended for the exercise to benefit others. She did not patent or commercialise the cane exercise. When she came, she taught for free- we did not pay any money to attend her class. In Petaling Jaya, the class that is led by Master Yong- participants only pay a nominal amount to cover the cost of renting the community hall. Master Yong is a very compassionate man. 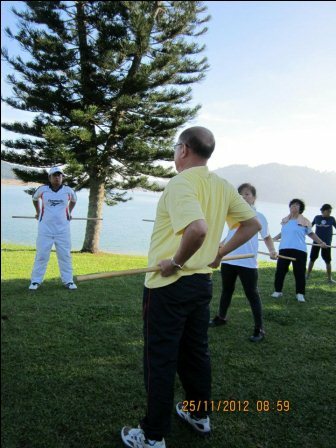 Prior to publishing more information about cane exercise, I’ve called Master Yong to request for permission and consent to publish the photos. And to help the readers as some have requested for more information and also expressed interest to buy the cane. He mentioned that if there are any groups that are interested to start the class within the travelling distance, he can try to go and provide some guidance. Thank you so much for putting up the pictures and all the write out. This is amazing and for all the good job done!…. So people out there does not matter young or old do come and join me this weekend and any other weekend over at Mengkuang Dam. Am sure each and everyone of you will benefit loads…..for will enjoy good quality of life as well. See You All Soon!…Hope my group will get bigger in no time. Your dedication to help others is truly admirable. Hopefully more people staying near the area would come to join and benefit from the class. Hi Ruby, thanks for visiting. The last I know off, there is a class on Wednesday mornings at about 8am at the SS3 Community Center.